As the famous saying goes: "Too many chefs spoil the ill-conceived cash-in." In case you can't tell from the general wailing and gnashing of teeth, another Star Wars-branded title has slithered from Lucas Art's gaming birth canal. 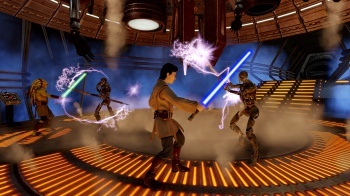 Kinect Star Wars was released today, and has thus far garnered a decidedly mixed critical reception. Unfortunately, no one is quite sure who is to blame for the Han and Lando dance number, as apparently a whopping ten development teams worked on the title. According to the LinkedIn profile of Adam N Joseph, the game's senior producer, he was tasked with managing "1 PC and 9 external teams (200+ heads)" during the game's production. Lucas Arts and Ghostbusters: The Video Game developer, Terminal Reality both worked on the game. The other teams involved include Kinectimals developer, Frontier Developments, Rhythm and Hues and Skywalker Sound. It's rumored that stodgy shooter developer, Spark Unlimited, of Turning Point: Fall of Liberty and Legendary fame, was involved as well. "Pre-emptive tweet, since I'm seeing q's again: @Harmonix and @Dance_Central have nothing to do w/the dancing mini-game in Kinect Star Wars."